Having to choose between 32-bit and 64-bit options when downloading an app or installing a game is pretty common, and many PCs will have a sticker on it that reads 64-bit processor. You’ll be hard pressed to find a sticker on one that reads 32-bit. It’s pretty easy to conclude like you do with most things that more is better, but why is that exactly? Unless you’re a genuinely computer savvy individual you won’t know what the real significance of the difference between the two. There is some meat to that though, and here at 4GoodHosting as a top Canadian web hosting provider we try to have our thumb on the pulse of the web hosting and computing world. Having a greater understanding of what exactly is ‘under the hood’ of your desktop or notebook and what’s advantageous – or not – about that is helpful. 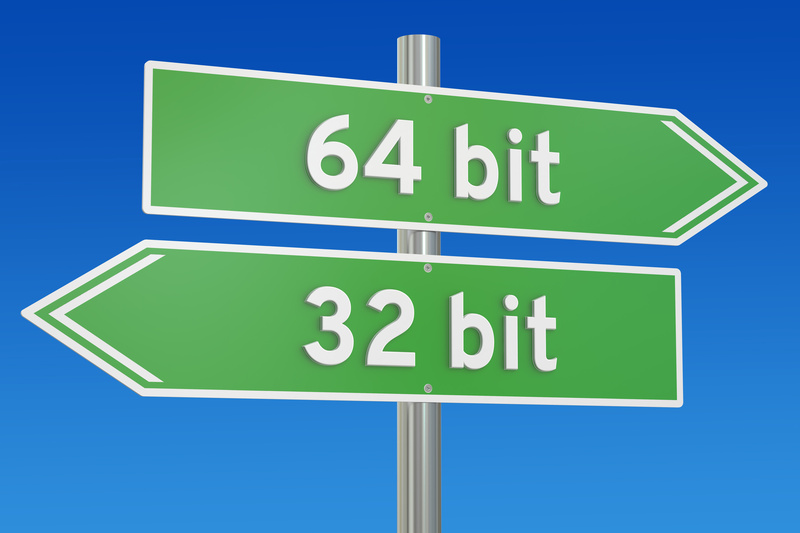 So let’s have a look at the importance difference between 32-bit and 64-bit computing today. First and foremost, it’s about capability. As you might expect, a 64-bit processor is more capable than a 32-bit processor, and primarily because it can handle more data at once. A greater number of computational values can be taken on by a 64-bit processor and this includes memory addresses. This means it’s able to access over four billion times the physical memory of a 32-bit processor. With the ever-greater memory demands of modern desktop and notebook computers, that’s a big deal. The key difference in that is something else. 32-bit processors can handle a limited amount of RAM (in Windows, 4GB or less) without difficulty, while 64-bit processors can accordingly take on much more. The ability to do this, however, is based on your operating system being able to take advantage of this greater access to memory. Run anything Windows 10 or up for a PC and you won’t need to worry about limits. The proliferation of 64-bit processors and larger capacities of RAM have led both Microsoft and Apple to upgrade versions of their operating systems now designed to take full advantage of the new technology. OS X Snow Leopard for Mac was the first fully 64-bit operating system to arrive, nearly 10 years ago in 2009. iPhone was the first smartphone with a 64-bit chip, the Apple A7. Basic version of the Microsoft Window OS had software limitations with the amount of RAM available for use by applications. Even in the ultimate and professional version of the operating system, 4GB is the maximum usable memory available from the 32-bit. Before you think that going 64-bit is the solution to having nearly unlimited processor capability, however, understand that any real jump in power comes from software designed with to operate within the architecture. These days, the recommendation is that you shouldn’t have less than 8GB of RAM to make the best use of applications and video games designed for 64-bit architecture. This is especially useful for programs that can store a lot of information for immediate access, and ones that regularly open multiple large files at the same time. Another plus is that most software is backwards compatible, which allows you to run applications that are 32-bit in a 64-bit environment and not experience performance issues or make it so that there’s more for you to do. There are exceptions to this, and the most notable of them are virus protection software and drivers. The hardware of these installs usually require the proper version be installed if they’re going to function properly. There’s likely no better example of this difference than one found right within your file system. If you’re a Windows user, you’ve likely noticed that you have two Program Files folders; the first is labeled Program Files, while the other is labeled Program Files (x86). All applications installed shared resources on a Windows system (called DLL files), and how they are structured depends on whether they’re used for 64-bit applications or 32-bit ones. Should a 32-bit application reach out for a DLL and discover that it’s a 64-bit version, it’ll respond quite simply in one way – by refusing to run. 32-bit (x86) architecture has been in use for a good long time now, and there are still plenty of applications that run 32-bit architecture. How they run on some platforms is changing, however. Modern 64-bit systems have the ability to run 32-bit and 64-bit software, and the reason is because they have 2 separate Program Files directories. 32-bit applications are shuffled off to the appropriate x86 folder, and with that Windows then responds by serving up the right DLL, – which is the 32-bit version in this case. On the other side of things, every file in the regular Program Files directory can access the separate content. Naturally, we can expect 32-bit computing architecture to go the way of the Dodo bird before long, but it’s interesting to note that the superiority of 64-bit is the sum of more than just being a doubling of bits between the two.